Sire: Bumble Hill Shillac, Grandsire ILR PPPeruvian Allin Capac, Granddam Roblee Shillelagh. Dam: Tarraganda Lodge Daphne, Grandsire Pinjarra Buenisimo, Granddam Elysion Josephine. After the death of Jazz’s sire Shillac we were on the look at for a suitable son to replace him. 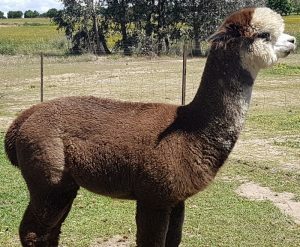 While shearing at Lemarli Alpacas we came across Jazz and also seen his Dam and siblings and were suitably impressed. He has a highly crimped style of fleece that is even across his body and extends into his brisket. He has good density and fantastic length. His saddle is an even dark grey with no spots in it, it is so dark it is almost roan. He has started working and we are patiently waiting for his progeny.